A milestone: my list of Digital Humanities GIS projects has now topped 100 entries. It currently stands at 103 entries, the latest to be added being the Google-sponsored Routes of Sefarad, mapping Jewish Heritage in Spain, and Placing Literature, an ambitious attempt to crowd-source the locations of novels. The original aim was to catalogue academic mapping projects; my interest was in how the new digital ‘neogeography’ was being used in universities, and for what ends. But the list has drifted away from this, to cover literary and historical mappings in general. So projects produced outside academe are listed as well. I’m not aiming to be comprehensive, and have enough data for my original purpose, but I will continue to maintain this list in an ad hoc fashion. Know of a project not listed? Put it in the comments. For more maps, more than you could possibly explore in a lifetime, see Google Maps Mania – which goes beyond what the name suggests. And for weird cartography, see the ever excellent Strange Maps. I read these words on a plane, at an altitude of somewhere round 37,000 feet, somewhere over Denmark or Germany, perhaps even Sweden or Holland. I had my phone with me – who wears watches these days? – but it firmly stated it could not locate my position. At that very moment, when technology had uncoupled, when the view was restricted by a small window and a fixed chair, when only glimpses of land could be made between the clouds, when that land offered only unfamiliar landmarks, I truly did not know where I was. But I wouldn’t have noticed if I had not been reading this piece by Perec. Such were the dry descriptions given in court of the vandalism carried out by Kenneth Halliwell and Joe Orton on numerous books in Islington public libraries. Rarely seen, they are currently on display at the Islington Museum until February 25th (the end of this week – hurry hurry hurry!). The understatement of the court-room minimizes the ferocious transgression of Halliwell’s and Orton’s activities. They had been stealing books for nigh on four years, cutting out plates – some were used for decorating their flat – then redesigning and collaging the covers, sometimes adding fantastically obscene blurbs. They would then replace the books on the shelves, and watch for an unsuspecting member of the public to browse them. Several themes are apparent in the volumes chosen and their subverted covers. The Arden Shakespeare series are treated with great respect, being given dramatic and exciting images reflecting the subject; the critique is of the plain design of the series, monotone and dull, putting passionate work into the equivalent of a plain brown bag. The pulp literature and easy reading was given a more mocking treatment: the startled simian bouquet of the Collins Guide to Roses (a gibbon according to some sources, a baboon for others, although the Mirror headlined with ‘Gorilla in the Roses’); another monkey and assorted unlikely faces for The Great Tudors; even more apes for Exotic Cage Birds; the betrothed cats – with a kitten implying the motive for marriage – on Agatha Christie’s The Secret of Chimneys. Along with grotesque juxtapositions were queer entendres: the Queens Favourite was wrestling men. But it is the biographies that inspire the greatest iconoclasm: The Lunts – a theatrical couple of some repute at the time – are portrayed as grotesquely garish childrens’ toys, John Betjeman is tattooed from neck to feet, Alec Clunes’s portrait is a smashed skull and Dame Sybil Thorndike, a statutesque amazon on the front cover, was not just looking at “a man’s torso” but staring straight at the crotch on the back. Thus far, some inspired defacing. But it was using these works to provoke scandal that brought them notoriety, and gives them a guerilla aspect. They were designed to rupture the staid ambience through a rough surrealism and blatant sexuality. “I used to stand in corners after I’d smuggled the doctored books back in the library and then watch the people read them. It was very funny, very interesting.” said Orton afterwards. Most of their work was destroyed after a trial that saw both men sent to prison and given fines that nearly impoverished them: “because we’re queers” in Orton’s opinion. What is on display, around 40 covers, is all that survives of these remarkable productions. The exhibition frames these works as an investigation into the juvenalia of a famous and celebrated playwright. These are his youthful exuberances, before finally ‘cracking it’ and breaking into the mainstream. But given their queer aspect, the lives of their makers and the vindictiveness of the trial, it is worth considering these works without hindsight and in their own moment. Had Orton not been successful, what would have been made of these works? Would they have been less interesting, less intelligent, the work of a vandal rather than a critic? I think not. Even if Orton hadn’t been successful – and such a way of framing it underplays the equal contribution of the unrecognized Halliwell – these collages would still embody a contempt for boredom, a queer ‘in your face’ aesthetic, and a provocation outside the art gallery, executed with quite some skill. And as at the time, they were a couple of unknown, pre-1967 gays, constrained by and pushing against the mores and the policing of the time, it is in that light they should be appreciated. Above, film of Joe Orton interviewed by Eammon Holmes Andrews (whoops!) about his library exploits. “Malicious Damage: The life and crimes of Joe Orton and Kenneth Halliwell in Islington” is on at the Islington Museum until 25 February 2012. A book of the same name is rumoured to have been held up for legal reasons. Quotes from the trial taken from “Because We’re Queers: The life and crimes of Kenneth Halliwell and Joe Orton”, by Simon Shepherd, Gay Men’s Press 1989. Open Library record. Quotes from Orton from “Prick Up Your Ears” by John Lahr, Penguin 1980. Open Library record. Zotero is an open source reference manager, produced by the Roy Rosenzweig Center for History and New Media. To say ‘reference manager’ understates what it is capable of: you can use it to organize your reading, collaborate with others, and produce bibliographies in a matter of seconds. Having started off as a Firefox plug-in, it has recently released a beta of a stand-alone application. More versatile than the browser-based version, it is however a little more tricky to install on Linux. (On OS X it installs via the usual click, drag and drop.) Hence this post. These instructions are based on Ubuntu 11.10, with the Unity desktop, but they should work for any variant. Certainly it works for my preferred flavour, Xubuntu. Warning: this is beta software! Warning 2: these instructions come with no guarantee of success! You’ll get something like i686 if you are running a 32 bit system, and x86_64 if you have a 64 bit system. Note that you may be able to run the 32 bit version of Zotero on a 64 bit system, and that even if you have a 64 bit chip, your version of linux might be 32 bit. 2: Unzip it. You’ll now have a folder called Zotero_linux, appended with -i686 for the 32-bit version, and -x86_64 for the 64bit. [Update 1, 16/7/12: I missed a line here: Open the folder and locate the executable file, named ‘zotero.’] Right click on it, choose ‘properties’ from the menu, and then the permissions tab, and tick the ‘Program’ box to allow it to run as a program. This will move Zotero to your /opt directory. Note that because this is Ubuntu, the command has to be run with sudo. For many other linux distros, you’ll have to log in as root. 5: And finally, find and run it. Go to the ‘dash’ in the dock – or Application Finder, under Accessories in the Xubuntu menu – search for zotero, and it should show up under applications. Click and all being well, Zotero will start up. If you want to keep it in the dock, right-click the icon and tick the option to keep it there. Uninstalling: To remove Zotero, open a terminal and type: sudo rm -r /opt/Zotero_linux-[version] and sudo rm /usr/share/applications/zotero.desktop. The users own files are in the hidden folder ~/.zotero. Further support for Zotero can be found on their documentation pages and forums. This post is copyright under the CC BY license. Use to your heart’s content, but please acknowledge me! Last week I attended a seminar on the latest venture from Sheffield and Hertfordshire Universities’ family of digital history projects, Locating London’s Past. The aim is to create a sort of geographical front end to a number of London-centred datasets, among them its sister project, the famed Old Bailey Proceedings Online. Using a remarkable rasterized version of John Rocque’s 1746 map of London, the first Ordnance Survey map, parish boundaries, and underpinned by the ubiquitous Google map, the data can be plotted in the context of a contemporary city. The site isn’t live yet, but attendees were able to have a play with the beta version, and I found it very impressive. First thing I did was check for cases of monetary crime in the 17th and 18th centuries, and their distribution across the region. In a couple of minutes, I had formulated a query and got it displayed in front of me. St James Clerkenwell, St Giles in the Fields and St Martins in the Fields, all outside the City of London, came out top. It has been suggested that coining was a pursuit often practiced in slums; all three areas contained notorious rookeries. This was a quick experiment and one shouldn’t jump to conclusions. The number of cases was quite low – just 9 in St Giles, if memory serves. Population density and geographical size of the parish need to be taken into account. 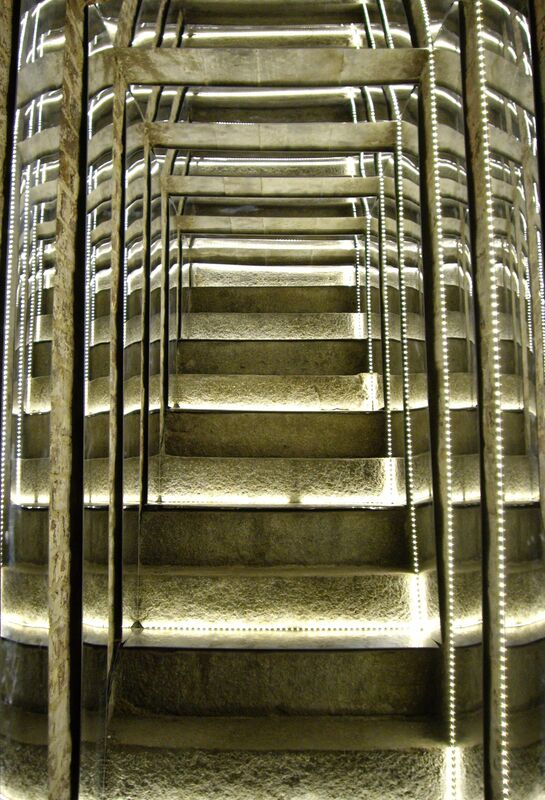 But it does illustrate the possibilities, and the ease of use, of this site. There were a few bugs and problems. The old difficulty of markers overlapping one another hasn’t been solved with this site. A toggleable, full-window view of the map would be useful, as zooming in on an area pushes its neighbours out of sight, diminishing context. The lack of unique URLs makes bookmarking and referencing very difficult. I also felt that it was difficult to see landmarks and thus orient oneself: a number of the test cases claimed to show marked differences between the City proper and Westminster, but without this political geography being explicitly marked on the map it looked more like a contrast between an indistinct west and east. And if this boundary had been explicit, the picture may have been described in a different way. I have a hunch that there are very important divergences between the City of London within the Walls, and the extramural wards. This is not easy to see on the site as it stands. A concluding discussion on digital history and GIS covered issues such as the lack of an academic GIS infrastructure, the lack of training available and the possibilities of importing and exporting data. The need for easy mapping software was only briefly raised, although the website dotspotting was recommended. What struck me later was that Locating London’s Past wasn’t your standard GIS-based website but a real investigative tool, requiring a high level of engagement on the part of the user. With many map-centric websites one can do little more than take a virtual walk through an area, looking at a restricted range of points. With LLP, one has to formulate a question, translate it into a search query and then analyze the output, which may be suggestive in itself but by no means obvious. The difference is partly due to the enormous quantity of geo-referenced data LLP has, so much that it cannot all fit on a map. But there’s a qualitative aspect as well, that puts the stress not on cartography but on the database. Without a question, there is nothing to see. Tim Hitchcock has said that London is the most digitized city in the world. More of its records have been made available online than anywhere else in the world. There’s more to do of course, most notably in relation to areas transpontine, but the focus now has to be on how we use this material. Locating London’s Past offers not just a visualization of data, but also a way of thinking about different uses of it. Unfortunately, they didn’t make the texts easily accessible. To obtain them one had to apply by email to be subscribed to a Dropbox folder. There is a database and search interface, but it requires registration, and is unclear as to who qualifies for an account. I think that the database holds the marked up, XML texts, which have not (yet) been publicly released. So I have created a package via the Open Knowledge Foundation’s Data Hub. You can download the zip package and an index in csv format from ckan. Note the zip bundle is around 142 mb. Don’t try this on dial-up. Check the index first. When I have time, I’ll work on a web interface that allows easy searching and sorting of it. I hope also that these texts will be made available individually, but given the number of them that’s not a trivial task. What to do with these texts will be discussed tomorrow, Saturday 13th August, at Textcamp (London); the twitter hashtag is #tcamp11. Update: xml (.tei) and epub versions are available from tei-Oxford. Update, 17/04/2016: the texts can now be found at Oxford Text Archive. Aaron Swartz was arrested a few days ago for the unauthorized bulk downloading of files from JSTOR, the academic journal archive. According to the indictment [pdf] , he faces up to 35 years in prison and a fine of up to $1 million. Alongside charges of “unlawfully obtaining information from a protected computer”, said indictment also makes outlandish claims of wire-fraud; the hyperbole is further ramped up by the Department of Justice’s Press Release [pdf]. Oddly, JSTOR have put out a statement saying they did not want to prosecute Swartz. At the moment, there’s more heat than light in the commentary around this case. We don’t know what Swartz intended to do with the documents he downloaded, nor why he obtained them the way he did. He has a strong track record for opening up information and analysing it: witness his liberation of court records, and his analysis of funding academic writing. But this case led me to think about JSTOR, what it claims to do, and the way it acts as a gatekeeper of academic knowledge. JSTOR is a not–for–profit service that helps scholars, researchers, and students discover, use, and build upon a wide range of content in a trusted digital archive of over one thousand academic journals and other scholarly content. We use information technology and tools to increase productivity and facilitate new forms of scholarship. Sounds good! Who could possibly have anything against a not-for-profit helping spread knowledge? Well, if you don’t have an institutional affiliation, if you’re one of the general public, reading the journals is an expensive business. There is no option to subscribe to the archive as a whole, and the pricing of individual articles is astronomical. Take, for example, the journal 19th Century Music. A single issue from the publishers costs $18 for an individual, a subscription for 3 issues $50 (discounted to $28 for students and the retired). The latest issue has 6 full articles, as well as various supporting material. On JSTOR, each article is priced at $12. That’s $72 for the substantive content of just one issue. JSTOR are even charging $12 for the two page preface. This is by no means exceptional: another University of California publication The Public Historian – oh the irony – is $17 for a single issue direct, but $12 an article on JSTOR, again even for two page editorials. Or again, a standard individual subscription to Radical Teacher is $24 – $28; a single article is $18 at JSTOR, even just for the front matter. One more time: $14 for an article from the American Historical Review when joining the AHA starts from $40 and gets you the journal plus many other benefits. As far as I can tell, these prices are around the average but some are much higher. Rogers’ article on the Black Act, published in the Historical Journal in 1974, is $34, which is $4 more than even Cambridge U.P.’s own inflated price. Some articles are being sold even though they have been legitimately released for free. For example, A Descriptive and Phylogenetic Analysis of Plumulaceous Feather Characters in Charadriiformes is available from JSTOR for $15 but can be obtained for free at the Searchable Ornithological Research Archive. Other material, like Law and History Review, doesn’t seem to be accessible at all to the public, yet there is no indication that the volumes for 1999 to 2009 are archived for free at the History Co-operative. This is not aiding the discovery and use of scholarly content. Then there is the murky area of those materials that are out of copyright. The William and Mary Quarterly from 1899? $9 an article. Likewise, it’s $14 for a single article from the Journal of Political Economy for 1892. This may be the fault of the publishers rather than JSTOR, but it points to a relationship between the two that excludes academic and public interests. This also raises the question of publicly-funded research being mined for profit by private institutions, as pointed out by Glyn Moody. It is not just a case that JSTOR is charging too high a price, whether in relation to other vendors, with comparable products or the pockets of those who would like to read this material. In economic terms, they could increase sales and revenue by lowering the price to hit that sweet spot where they maximise returns. My feeling is that they are deliberately trying to put the public off, restricting access through their pricing mechanism. I also have the feeling that charging these prices is directly contradictory to their status as a non-profit. I have found nothing on their website explaining how they price materials, or how they work with publishers. I find it extremely unlikely that they have absolutely no say in the prices they charge individuals for individual articles. Nor is there any information on how much revenue goes to the publishers. (It’s well-known that the authors don’t get paid through the current academic journal system.) Furthermore, I have found no financial information as to JSTORs revenues or outgoings, or whether it has, as a non-profit, tax-exempt status; nor have I found any information for Ithaka, with which JSTOR merged in 2009. Accountancy is not one of my skills, but I feel such information should be easily accessible on the website of a non-profit. This lack of transparency and openness I find disturbing. JSTOR is not living up to its declaration. It is obstructing the dissemination of scholarly, publicly-funded and public domain writing. It clearly has a commercial aspect, yet is shy of stating this. I can’t even be sure it is a not-for-profit in any meaningful, legal sense. It is a contributor to, not a solution for, the crisis in academic publishing. You can support Aaron Swartz via DemandProgress.org. UPDATE: The Philosophical Transactions of the Royal Society freed from JSTOR and the Royal Society, bittorrent at Pirate Bay! 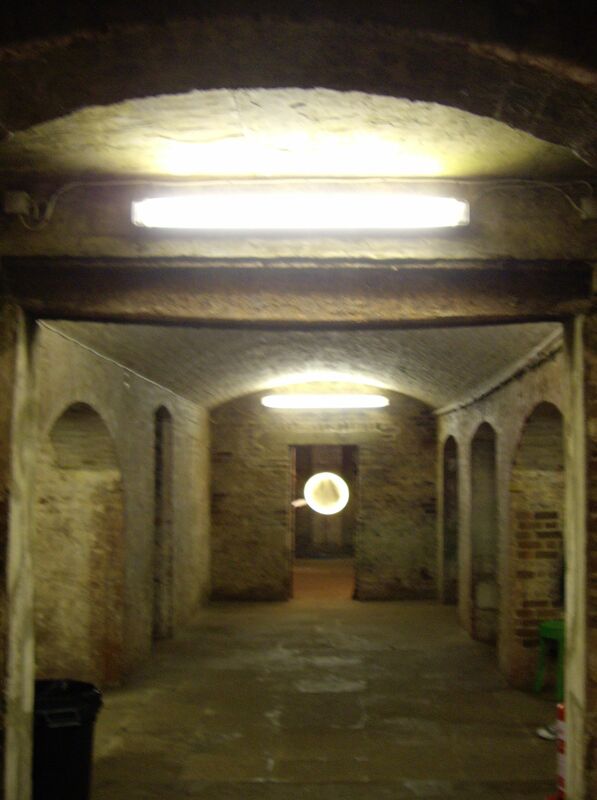 The recent Clerkenwell Design Week offered a rare chance to visit the vaults of the Clerkenwell House Of Detention, opened up to host an exhibition. 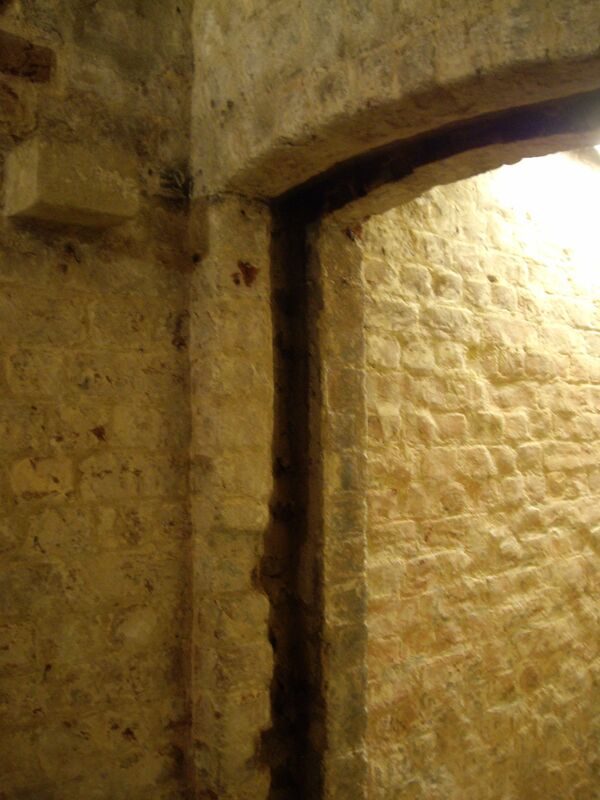 These cellars are all that remain of the 1847 prison, demolished at the end of the nineteenth century to make way for a school, which in turn has been converted into flats. 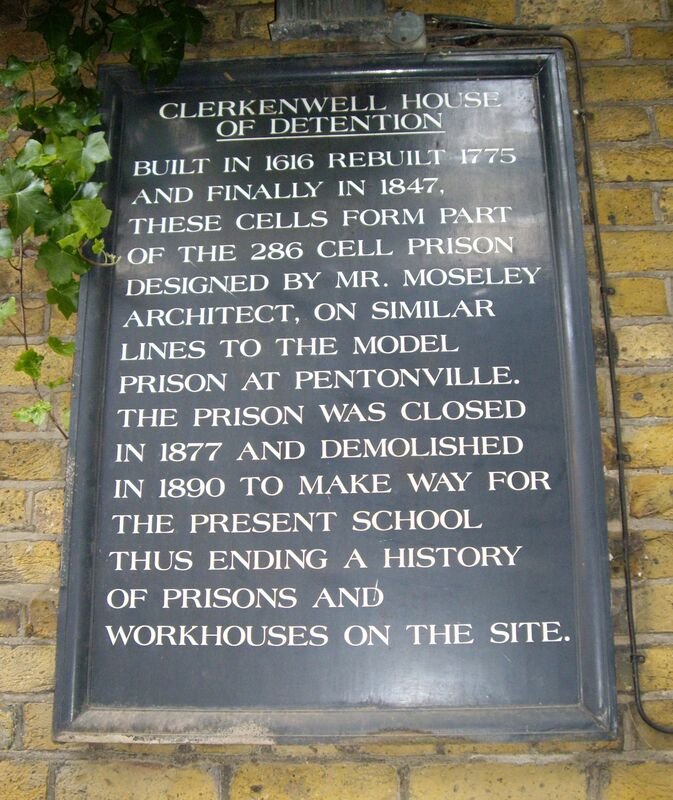 It’s a site with a long carceral history: the Clerkenwell Bridewell and the New Prison were established there in the early seventeenth century. Tens of thousands of unfortunates, including children, passed through its gates. It also has a parallel counter-history: scene of one of Jack Sheppard’s many escapes, attacked during the Gordon Riots, and the site of the first Irish bombing in London, the ‘Clerkenwell Outrage‘ of 1867. Since the prison’s demolition, the cellars have only been opened to the public occasionally. They were shelters during the second world war, have been used for office and storage space (according to wikipedia), turn up as TV settings fairly regularly and recently were the stage for performances of Oliver Twist and Macbeth. It was also a museum between 1993 and 2000, apparently closed down by Customs and Excise due to non-payment of tax. Rumour has it that it is going to be redeveloped, but rumour also has it that the site is subject to some legal dispute. I recall visiting it some 15 years ago, when it hosted a somewhat sparse display in a subdued light. 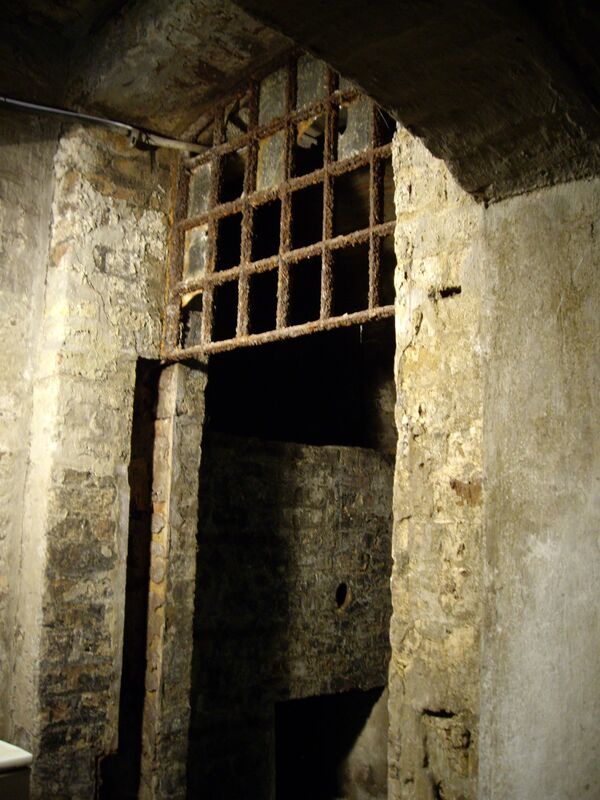 In a way, that was to its credit; one could be captivated by the material remains, the pokey cells, dark tunnels leading off into the distance (apparently, one led to the local courthouse), the whole purgatorial atmosphere. 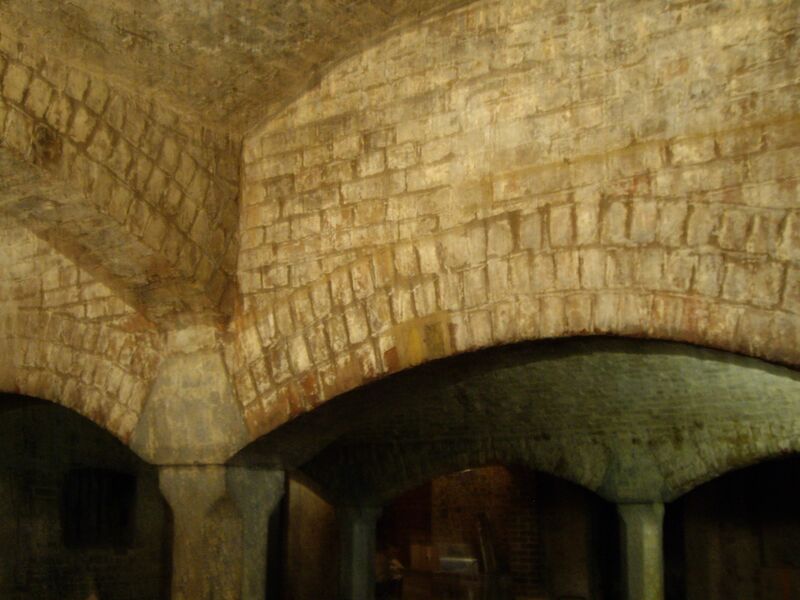 Today the vaults are much cleaner, there’s been both restoration work and a general tidying up, and there was more than enough illumination. Walking around it now my feeling is of excitement, rather than horror as previously. 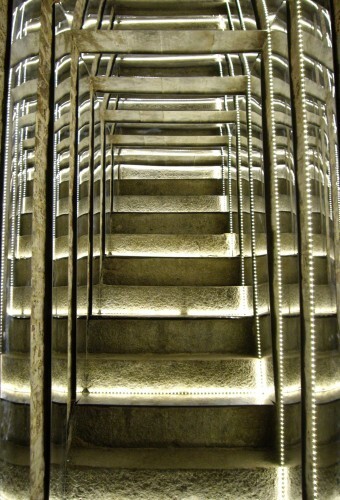 There is a different sense of the underground, one of art and play, rather than infernal depths. 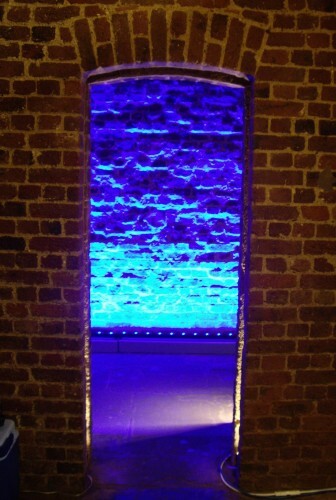 Certainly, it’s a great venue for a party, with so much to explore, so many places to hide and seek. And it’s far better than being used as a prison. But I have a lingering unease at the banishment of its terrors, of its history as a penal institution. 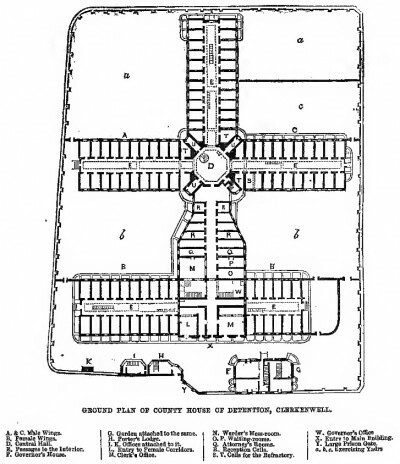 The ground floor plan off the House of Detention, taken from Mayhew's The Criminal Prisons of London, 1862, page 612. A rusting iron door on one of the cells. 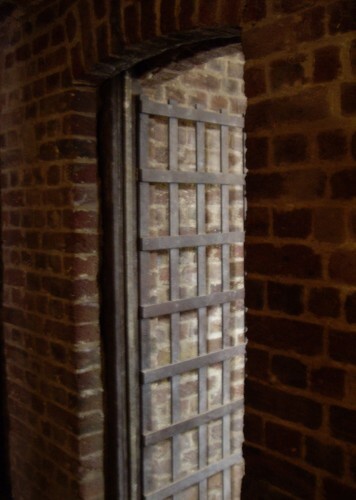 This cell seems to have had some sort of portcullis arrangement, rather than the usual door. Solid brick vaulting in a large open-plan space. 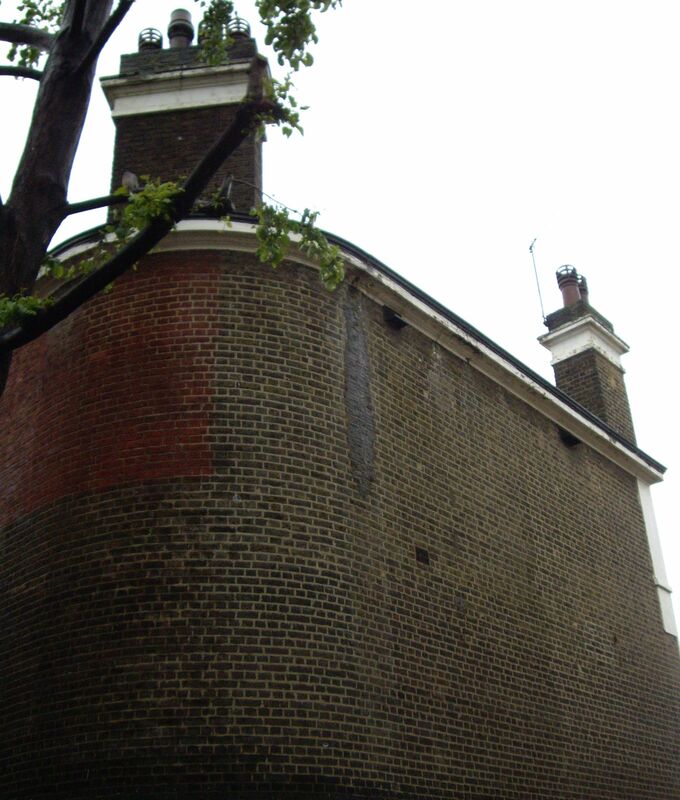 This building, on the corner of the site, looks as is if it predates the school. The absence of street-facing windows makes me think it might have been part of the prison. More: Wikipedia, Victorian London, Mayhew, The Criminal Prisons of London, 1872 map of Clerkenwell, Londonist, Itasca Locations. 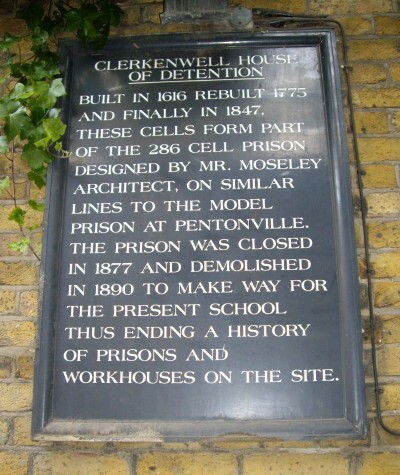 Update 2/10/2012: The Survey of London volume for South and East Clerkenwell, covering the prisons, has just gone online. Text and photos licensed under a Creative Commons Attribution-ShareAlike 3.0 Unported License. 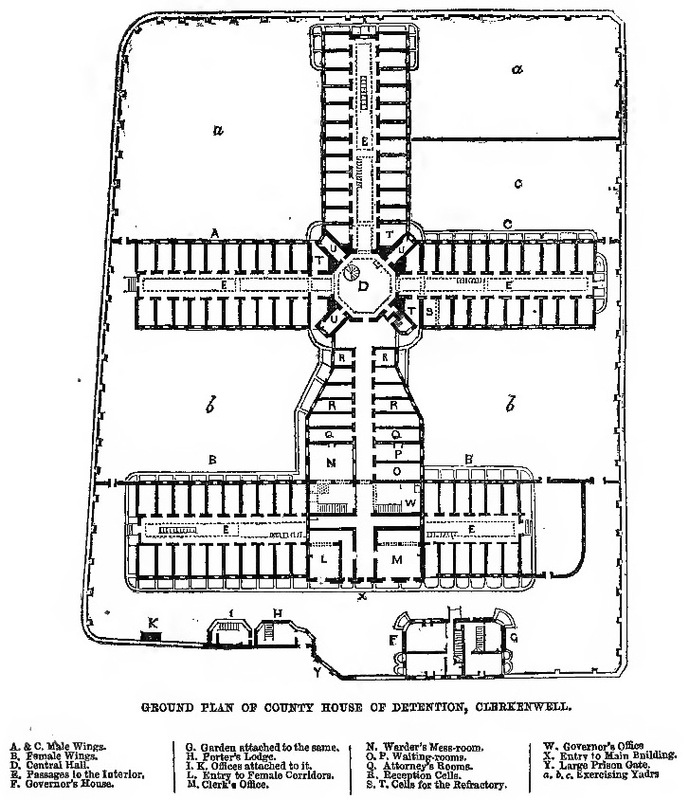 Plan of the House of Detention free of known copyright restrictions. 1: The Luddites are politically charged. The word is commonly used today as a slur to anyone questioning modern technologies. The impetus behind many of the commemorations is coming from activists involved in campaigns against the likes of genetically modified foods and cloning. This isn’t an academic or antiquarian history. In some instances, signals were made by rockets and blue lights, by which they communicated intelligence to the parties, and the system evinced an extraordinary degree of concert, secrecy and organization. This quite confuses the traditional view of the Luddites as being indiscriminately against all technology. There’s judicious adoption of modern communications here! 5: Were the Luddites successful? Iain Boal made an important point about what success means. Just putting off mechanization for a generation, to safe-guard the livelihoods of weavers, is a victory (of sorts). The talks were recorded by the Backdoor Broadcasting Co., and are available now. Meanwhile, follow the Luddite Bicentenary blog and Luddittes 200. After months of work, Mapping Petersburg is now live! Built in collaboration with Dr Sarah J. Young, it is a pilot for a much larger project taking in two centuries of the Petersburg text. The aim is not only to investigate the actual writings, but also to see what tools and techniques are applicable to ‘literary cartography’, and to theorize just what it means to read a book in such a fashion. This test case focuses on Dostoevsky’s Crime and Punishment, plotting the places, events and characters of that novel upon a backdrop currently provided courtesy of Google via Mapstraction. 1: Data sets are hard. It’s painstaking work generating data, especially from an unstructured, subjective text like Crime and Punishment. 2: Get into the source. The first map took ages to make, hand-coded as it was. But being close up to the code taught me alot. 3: A little code goes a long way. The first script to automate data-plotting took ages to write. But once it was done, I was able to generate a map in a few minutes. 4: We need research, theory, design. There are many possibilities when making maps, and even something seemingly simple, like icons, requires a lot of thought. 5: We need documentation. There were a number of promising tools that had to be put aside, because without documentation they were little more than black boxes. No, source code isn’t enough. And similarly, it behoves the ethical webmaker to describe how they constructed their site. 6: Geo-rectification is complex. We had wanted to use maps contemporary to Dostoevsky, but ran into all sorts of difficulties. Tools like Mapwarper are great, but without understanding it, and understanding the mathematics behind it, I was unable to surmount the problems we faced. 7: Maps are to be read. They are not transparent depictions of place. One can just as much read the map through the book as the book through the map. 8: The Digital Humanities is all about building things. The experience of doing is irreplaceable and inexhaustible.